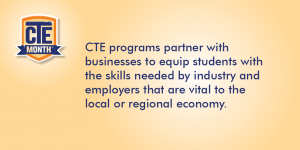 We’re over halfway through #CTEMonth and states, employers, districts, schools, educators, parents and students have honored and celebrated CTE in a number of ways already. States have been critical in supporting this effort throughout the country, from providing resources to the local level, to meeting with policymakers. 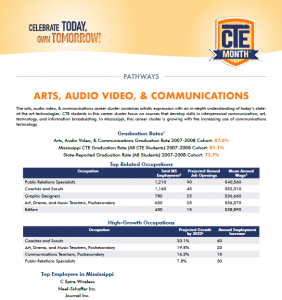 Alabama Department of Education developed a CTE Month communications plan with tips on how to get positive media coverage, sample social media posts, blog ideas featuring educators and students, and a sample press release. 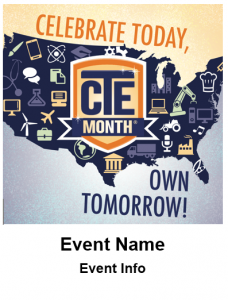 Additionally, they provided their network with a sample proclamation, calendar and sample announcements to help schools in Alabama get the word out, and raise awareness about their CTE programs. the toolkit, they provided a templated poster to announce events, CTE Month-branded press kit with letter head, a state profile and pathway specific flyers, and CTE-fact graphics, one for each day of the month, providing a coordinate set of messages and branding to use at the local level. In Virginia, the Virginia Department of Education’s office of Career and Technical Education met with Career and Technical Student Organization presidents and Commonwealth officials as Governor McAuliffe signed the Proclamation designating February as Career and Technical Education Month. The Governor spoke at length with the students about Virginia’s initiative: Profile of a Virginia Graduate, which focuses on skills and attributes such as critical thinking, creative thinking, communication, collaboration and citizenship, to be successful in life. The Governor identified Career and Technical Education students as a perfect example of what the initiative hopes to achieve. In Kentucky, the Department of Education held an event where State Officers from each of the Career and Technical Student Organizations gathered for training on the legislative process including a debate of current issue and role plays of actual legislative visits. The following day, State Officers visited legislative leaders to share more the value and impact of CTE. This entry was posted on Friday, February 17th, 2017 at 3:17 pm	and is filed under Resources. You can follow any responses to this entry through the RSS 2.0 feed. Both comments and pings are currently closed.